The Skinny: Follow-up to The Heroic Trio is more compelling but also more over-the-top. If you can handle the abundance of sappy montages, then you should be okay. The follow-up to the hit The Heroic Trio is much more serious. The result turns out to be more compelling, but the overdone direction can leave you bewildered. Thankfully, the ace cast of Michelle Yeoh, Anita Mui and Maggie Cheung return, and the production proves to be just as entertaining as the first film, if not more. Years after the wonderful incidents of The Heroic Trio, the world has apparently gone to hell. An apocalyptic future awaits out heroes, and to top it all off there's a water shortage. It seems megalomaniac Mr. Kim (Anthony Wong in makeup) owns all the world's uncontaminated water. However, all that turns out to be a scam as there's plenty of uncontaminated water just out of reach of the populace. Our heroes decide to combat Mr. Kim's blatant water bill fraud by seeking out the pure water source. Thief Catcher (Maggie Cheung) teams up with a hat-wearing rogue (Lau Ching-Wan) to find the water, while Invisible Girl (Michelle Yeoh) attempts to protect the President and prevent a military coup by the power-hungry Paul Chun. Meanwhile, Wonder Woman (Anita Mui) has domestic issues with police chief hubby Damian Lau. Then she goes missing, which can only make matters worse. The plot is waaaay ridiculous, but Ching Siu-Tung's action is terrific. Johnnie To goes overboard with a veritable marathon of montage sequences. 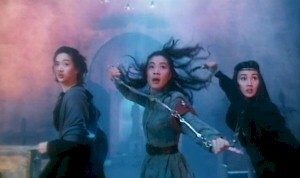 It seems every key moment in the film needs to be punctuated by a pop song usually sung by Anita Mui. The overdone romanticism sort of works, as the film has incredibly huge tonal shifts which change between silly and tragic. The plot shifts gears quickly, making the film a strangely wrenching experience. Note:  Like its prequel, Executioners was purchased by Miramax/Disney and is currently no longer available in a subtitled, letterboxed DVD from Tai-Seng.